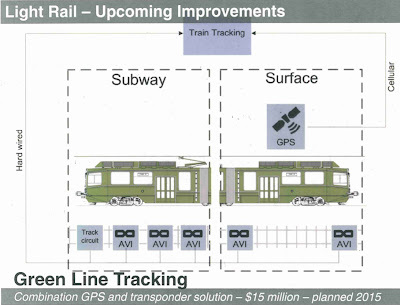 I'm surprised this hasn't shown up elsewhere yet, but at the Green Line public information meeting on Thursday, the presentation included a promise to install the necessary AVI and GPS tracking hardware to offer the same real-time tracking capabilities of the other lines on the Green Line as well, by 2015. I haven't had much time the last couple days so I will have to see if I can follow up on this with any further information. I also have other notes from the meeting that I'll have to get back to later. Update. The meeting began with a presentation from the T, the slides of which I will try to upload once I get a chance to scan it in from the printout I received. Amusingly enough, the presentation slides were being projected from a laptop which broke down halfway through, and we had to continue without it. Commissioner Timlin was present as well as a representative from the Town of Brookline and they both said they were looking at integrating traffic signal priority. The new plan for transportation could include $750 million for a replacement fleet of Green Line cars and upgrades to the power infrastructure, equipment which dates back to the 1940s and is currently insufficient to run more 3-car trains. They have to stagger the arrivals of 3-car trains in the Central Subway to prevent overloads. Proof-of-payment stalled because of problems with deployment of fare equipment to all the stations. The reason that the T instituted the front door-only policy was explicitly due to anecdotal complaints of fare evasion, not actual data. The scheduling department has run simulations of station elimination to determine changes in travel time for riders coming from the station and those coming from further up the line, they may revisit it again. One participant suggested an extension of the Heath Street "E" branch from its current terminus another half-mile down to Hyde Square, a thriving neighborhood that was formerly on the Arborway route. They are unable to run more routes to Lechmere because there aren't enough trains (approximately 155 in working order). The remaining underground stations which need to be retrofitted for accessibility are Government Center, Hynes Convention Center, Symphony and Boylston. Only Government Center is programmed. The installation of a crossover at Park Street to make the second track usable for through-service is now no longer being considered due to cost. A representative from Longwood Medical Area noted that of their 45,000 employees approximately 44% use the T and the "D" branch is becoming problematically overcrowded. A suggestion: Needham ought to be a branch of the "D" line. Also, the new developments near Riverside station are cut-off from decent pedestrian access to the station. The current state of accessibility on the Green Line is unacceptable. Brookline Hills is listed as "accessible" but it is not. Oftentimes operators don't know how to use the lifts and they complain of "rust" which isn't the case. It seems to take a minimum of 20 minutes to use the lift when it does work. Better answers are needed.